What are "lumens" and "watts" for your LED lighted mirrors? How are they calculated? Do your LED lighted mirrors have enough light for my bathroom? What is the Color Temperature (Kelvins) of your LED mirror lighting? What Color Temperature should I use? What is the Color Rendering Index (CRI) of your LED mirror lighting? Are your LED lighted mirrors dimmable? Do your LED lighted mirrors have switches? Do your LED lighted mirrors have plugs to plug into a wall outlet? What are the Dimensions and Construction Details of your LED lighted mirrors? What are the electrical specifications of your LED lighted mirrors? What are the upgrade configuration options for your LED mirrors? We use super high quality LED strips in all of our LED mirror products. For LED lighting , "lumens" should be used as a measure of brightness, not watts. "Watts" describes the amount of power needed to drive the LED light, which is typically significantly less than the wattage required to drive a traditional incandescent light bulb having the same brightness. For rectangular side-lighted mirrors, if the mirror is a side-lit mirror, subtract 10 inches from the mirror perimeter. For example a 24 x 36 inch side-lighted rectangular mirror would be 24+24+36+36 = 120 inches minus 10 inches = 110 inches (or 9.2 feet) approx. LED length. For front-lighted rectangular mirrors and LED medicine cabinets, use the same formula but subtract 16 inches from the mirror perimeter. For round side-lighted mirrors, subtract 5 inches from the mirror diameter, then take half of this number and multiply by 6.28. For example, for a 24 inch round side-lighted LED mirror: 24 - 5 = 19 inches. Half of 19 is 9.5 inches. 9.5 x 6.28 = 60 inches (or 5 feet) approx. LED length. For round front-lighted mirrors, use the same formula but subtract 8 inches from the mirror diameter instead of 5 inches. For oval side-lighted mirrors, subtract 5 inches from the length of the mirror to get "Length A" and subtract 5 inches from the width of the mirror to get "Length B", then plug these values into this calculator tool to get the length (make sure to select length in inches). For example, a 24 x 36 inch oval side-lighted LED mirror would be 79.7 inches (or 6.64 feet) LED length. For oval front-lighted mirrors, use the same formula but subtract 8 inches from the length and width instead of 5 inches. Calculate Lumens: To determine lumens, first get the length of your LED strip in feet. If you have the length in inches, divide by 12. Multiply the length (in feet) of your LED strip times the number of LEDs per foot (40) to get the number of LEDs, then multiply the number of LEDs by 22 lumens per LED to get total lumens. For example, a front-lit 24 x 36 inch mirror has a perimeter of 24+24+36+36 = 120 inches. Subtract 16 inches to get the approximate length of your LED strip (120 - 16 = 104 inches). Divide by 12 to get number of feet (104 / 12 = 8.66 feet). Then multiply by 40 to get number of LEDs (8.66 x 40 = 346.4 LEDs), and then multiply the lumens by the number of LEDs to get the total lumens of the LED mirror (346.4 x 22 = 7,620.8 lumens). CAUTION: Even thought this calculation is a rough guide to determining the lumens output of the bulbs in your LED strip, keep in mind that The LED is mounted on the frame behind the mirror with the LED output projecting sideways from a channel in the frame, and that the LED light is refracted through frosted glass on the front of the mirror. The light emitted is not direct light. It is diffuse light, and will not have the same brightness characteristics of a bare bulb. Please see our response to the FAQ question "Do your LED lighted mirrors have enough light for my bathroom?". Please note the chart below, which provides a rough mapping of Lumens to LED and Incandescent bulb wattage. LED mirrors are designed to provide optimal light conditions for the person standing in front of the mirror, to help with grooming and makeup activities. The LED light is a diffuse light that is not intended to be the primary lighting in the room, and the light projects straight forward through the frosted glass, it does not project into the corners of the room. We strongly recommend including additional ceiling or wall lighting to serve as the primary lighting in the bathroom. However, we do offer a 2x LED Brightness upgrade which doubles the brightness of your LED by installing a second LED strip on your LED mirror frame. This upgrade will effectively double the brightness of your mirror output. Typically customers who install this upgrade will also order a Dimmable Power Regulator upgrade to allow control of the LED lighting brightness using a compatible wall dimmer switch (not included). Regardless of whether you choose to install the upgrade, we still strongly recommend also having separate primary lighting in your bathroom. Our LED mirrors come standard with 6000 Kelvin color LED strips, which we feel provides optimal "natural daylight" light for makeup and grooming applications. We also offer a 3000 Kelvin Upgrade (not available for LED medicine cabinets). As you can see in the chart below, 3000 Kelvin provides a "warmer" yellowish light more like a standard incandescent light bulb. The warmer color temperature helps you to see how you would look under softer lighting conditions. Which LED color option you choose is a matter of personal taste, options provide the same brightness (lumens) based on the size of the mirror. The Color Rendering Index is a scale from 0 to 100 percent indicating how accurate a light source is at rendering color. The higher the CRI, the better the color rendering ability. Light sources with a CRI of 85 or better are considered very good at color rendering. CRI is independent of color temperature, and is the same for our standard 6000 Kelvin LED strips and also for our 3000 Kelvin LED strips which are an available option for most of our LED mirrors. We can upgrade your LED mirror to include a Dimmable Power Regulator that will allow you to connect your mirror to an LED-compatible wall mounted dimmer switch. If you prefer a remote control option, or if you prefer not to pay an electrician to install wiring in your wall to connect a wall switch, we offer a Remote Control Dimming option. Most of our small and medium sized front-lighted rectangular LED mirrors and LED medicine cabinets include switches, which are mounted along the bottom side of the mirror frame. Our side-lighted rectangular mirrors, round mirrors, and oval mirrors do NOT include switches. If your front-lighted rectangular mirror does not come with a switch, we offer an available switch upgrade to install a switch. If you do not have a wall switch to connect to your mirror, and you need to have a separate switch capability, we offer an upgrade to install a Remote Control Switch / Dimming option. Our LED mirrors are not configured with wall outlet plugs. However, it is very easy to connect a plug to our LED mirror wiring, please see our LED Mirror Wiring Scenarios blog article for more details. Our Two-Piece LED mirrors have a separate commercial-grade anodized aluminum frame which is attached to the wall separately from the mirror, allowing the electrical connections to be completed before mounting the mirror. This makes for a very easy installation because the frame is open to the house wiring. See installation instructions here. The mirror then mounts on the frame using brackets that are attached to the back of the mirror. These brackets easily slide onto the aluminum mounting bars that are integrated into the frame. The frame is 1.5 inches deep, and the mirror is 5 millimeters thick, resulting in a very low profile installation. Front-Lighted LED Mirrors - the outer frame perimeter is approximately 1 inch inside the mirror glass perimeter. The inner frame perimeter is approximately 5.75 inches inside of the mirror glass perimeter. The top mounting bar is below the top inner frame and approximately 9 inches from the top edge of the mirror. The wall anchor brackets are attached to the bottom of the top mounting bar and to the top of the bottom mounting bar (which is also the inner frame). The 4 corner wall anchor brackets are approximately 2-3 inches inside of the left and right-side inner frame. On our larger (wide) mirrors, an additional wall anchor bracket is provided at the center of the top mounting bar. Side-Lighted LED Mirrors - the outer frame perimeter is approximately 2.5 inches inside the mirror glass perimeter. The top mounting bar is approximately 9 inches from the top edge of the mirror. The wall anchor brackets are attached to the bottom of the top mounting bar and to the top of the bottom mounting bar (which is also the outer frame). The 4 corner wall anchor brackets are approximately 2-3 inches inside of the left and right-side outer frame. On our larger (wide) mirrors, an additional wall anchor bracket is provided at the center of the top mounting bar. The mirror glass dimensions will be the exact same dimensions as described for the product. For example a 24" x 36" mirror is 24 inches wide x 36 inches tall. Our mirrors cannot be mounted in both directions, they are always mounted width x height. Our mirrors are high quality, 5 mm thick (almost ¼ inch) with polished edges. Our mirrors are copper-free and have lifetime moisture-proof backing. The frosted portion of the mirror (the LED lighting shines through this) is approximately two inches wide, and on our side lighted mirrors the mirrored area outside of the frosted area is also approximately 2 inches wide. Our LED mirrors are ETL-listed for the U.S. and Canada, conforming to UL Standard 962, certified to CSA Standard C22.2 No. 250.0. Our LED mirrors have power regulators installed which are connected on one side to your house electric, and on the other side to the LED lighting that is integrated into the mirror frame. Regulators: Mean Well - UL 8750 - IP67 - Input Voltage 100-240v AC. Output Voltage 12c DC. Protections: Short circuit / over current / over voltage / over temperature. 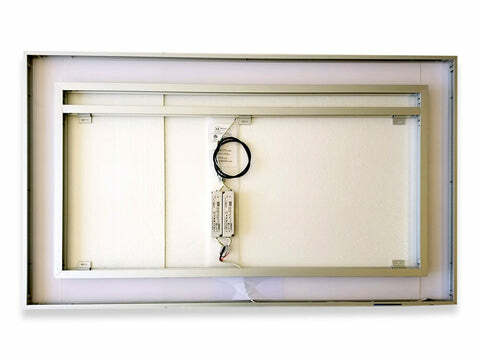 Our mirrors connect to a standard switched lighting circuit and are not dimmable. Please see our blog article for LED Wiring Scenarios for details about connection options. We have provided an entire article covering this topic, please see our blog article for LED Mirror Upgrade Options Primer.